Purchasing a rain barrel is an investment – in your money, time, and the environment. 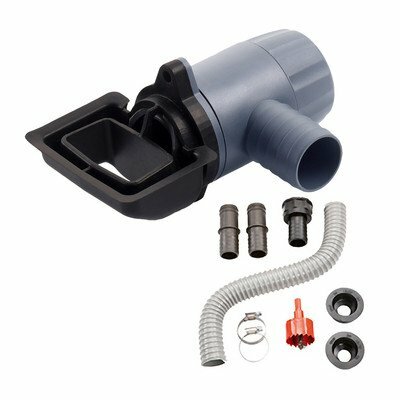 This Exaco Universal Rain Barrel Rectangle Connection Kit makes protecting those investments through potentially hazardous winters easy. Draining your rain barrel is paramount in order to prevent bursting of the barrel during freezing temperatures, and this kit includes all the parts necessary for that task; it will connect to any rain barrel with any rectangular sharped downspout, and includes the drill bit. There’s also a knob that allows for closing or opening of the water catcher (close during winter). Made in Germany. About Exaco Exaco USA Ltd. is a family-owned company located in Austin, Texas. Originally making its mark in the United States with the Exomixer painting blade in the late 1980s, the company has now been a vendor to major home center chains and national distributors for 17 years. While the Exomixer and its accompanying line of power drills remain Exaco’s bread and butter, the company also facilitates the custom fabrication of metal products for its customers as well as the production of many fine outdoor and gardening products. Exaco prides itself on working with a sheltered workshop in Austin that provides jobs for persons with mental disabilities. Connects any rain barrel with any rectangular downspout. All parts needed included, and drill bit. Made in Germany. If you have any questions about this product by Exaco Trading, contact us by completing and submitting the form below. If you are looking for a specif part number, please include it with your message.